Arnold Promise witch hazel plants are deciduous flowering shrubs that are prized for their bright blooms that arrive as early as March (in USDA plant hardiness zone 5). For many northern gardeners, this makes it a must-have bush for a four-season landscape. Witch hazel plants can be grown in planting zones 5 through 8. Plant taxonomy classifies the Arnold Promise witch hazel shrubs as Hamamelis x intermedia 'Arnold Promise.' The cultivar name is, as always, the name in single quotation marks. This type is a hybrid plant, being a cross between H. japonica (a Japanese species) and H. mollis (a species native to China). Further complicating its parentage is the fact that this cultivar is often grafted onto the rootstock of H. virginiana, resulting in a tendency for this plant to produce unwanted suckers in some cases. Sometimes witch hazel is referred to as a tree because, if left unpruned, they can grow to be quite tall. Moreover, the wild plant native to North America, H. virginiana, does grow as a small tree. Arnold Promise witch hazel shrubs are vase-shaped and may reach heights of 12 feet or more, with a similar spread, although they can easily be kept much shorter with regular pruning. Fall foliage is yellow at worst, and orange at best (it achieves optimal fall color when grown in full sun). The plant has yellow flowers with a warm, spicy fragrance; the smell conveys a sense of dryness, as when you smell clothing that has just come out of the clothes dryer. These blooms precede the leaves, blooming in late winter to early spring. The fringe-like petals on the flowers resemble small strips of paper from a shredder. From a distance, one could mistake witch hazel plants for forsythia (another early bloomer with yellow flowers). And, as with forsythia, people sometimes force the flowers of witch hazel plants. Ideally, grow witch hazel plants in full sun to partial shade and in a well-drained, acidic soil amended with compost. But these bushes do display some clay-tolerance. 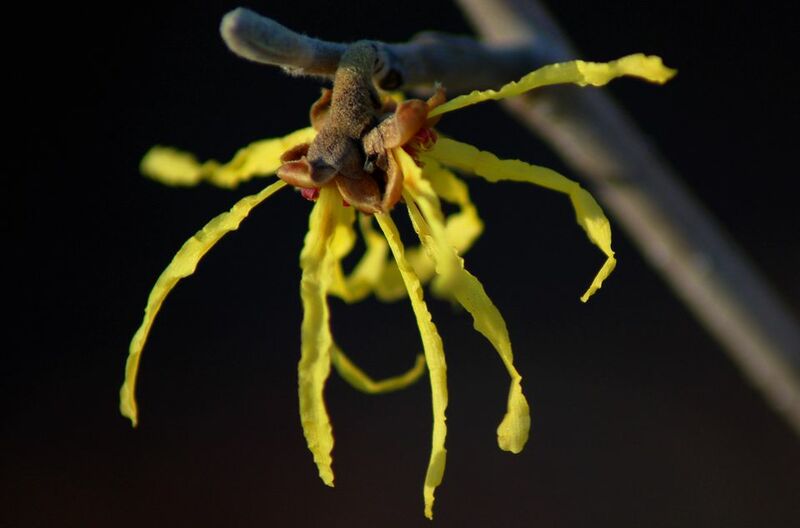 Understory trees in the wild, witch hazel shrubs are suitable for woodland gardens, although you will sacrifice some blooms and some fall color if you do not grow your witch hazel plants in full sun. Witch hazel plants are showy enough when in bloom to serve as minor specimen plants ("minor" because after blooming is finished during spring and summer, the bushes are rather ordinary-looking, although the vase-shaped form may be valued in winter by those who appreciate subtlety). Mix them into a bed of other deciduous bushes, situated within sight of a window so you can enjoy an unimpeded view of these beauties in late winter to early spring. You will see an eruption of yellow in the midst of the bare branches of surrounding plants. Prune Arnold Promise witch hazel shrubs to shape them, as desired after they flower in spring. Many gardeners largely avoid pruning and let their bushes grow as they want to, developing a natural shape. As with all shrubs, though, any time is a good time to prune out dead or diseased branches or one that rubs against another branch. Some varieties will produce suckers, and these should be pruned out in late fall. For winter protection and to shade the roots from summer's heat, mulch around your bushes. Keep the soil evenly moist to prevent the leaves from turning brown (known as "leaf scorch") during a hot summer and spoiling the good fall-foliage display. Mulch will also help in this regard, as a 3-inch layer of mulch around the bush will conserve moisture and help keep the soil from drying out. To fertilize, all you have to do is occasionally work some extra compost into the ground around the plant. European settlers in the New World used the branches of witch hazel trees as divining rods for dowsing. This is also the basis for one of the explanations behind the "witch" part of their name. The name ultimately derives from the Anglo-Saxon wych, meaning "bend"—which is just what a divining rod is supposed to do when it detects water. But religious leaders had given dowsing such a bad name over the years that it was apparently easy to corrupt the name into "witch" (another name for divining is "water witching"). Witch hazel is sometimes spelled with a hyphen ("witch-hazel") to indicate that it is not a true hazel. Corylus is the genus name of true hazels. But witch hazel may have been associated with hazel trees, which were used in Europe for dowsing. In addition, the bush's namers may have found a resemblance to the leaves of the true hazels, such as contorted hazelnut. If You Love These Shrubs, Set Them Free!